Ficha de Catálogo del Archivo de Indias. Plan Especial de Protección del Sector 7 "Catedral", aprobado provisionalmente el 31 de octubre de 2012. The third monument included in the World Heritage Site is the General Archive of the Indies. 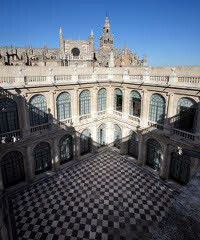 One of the clearest examples of the Spanish Renaissance style, the building of the Archive was originally conceived to house the Consulate of Merchants of Seville (Consulado de Mercaderes de Sevilla or Casa Lonja). The merchants had, to that time, often conducted their business on the steps of the Cathedral. However, inclement weather often forced them to continue their transactions from the chapter house of the Cathedral itself, which became the cause of great disapproval. As a result of this, in 1572 the Archbishop Cristóbal de Rojas y Sandoval wrote a letter of complaint to King Philip II who decided that Seville should have a proper exchange. Juan de Herrera, architect of the royal residence, El Escorial, designed the plans. The layout of the building of the General Archive of the Indies is a perfect square, with all sides measuring 70 meters in length, and in it is situated a large square central courtyard. To adjust for the uneven terrain on the building site, the building was constructed over a large base. Having ceased in its function as Casa Lonja, King Charles III established the General Archive of the Indies (Archivo General de Indias) in 1790 with the aim of gathering under a single roof all documentation from the House of Trade (Casa de Contratación) and the Council of the Indies (Consejo de Indias) or, in other words, all historical and diplomatic papers pertaining to the Spanish colonies in the Americas and Asia. 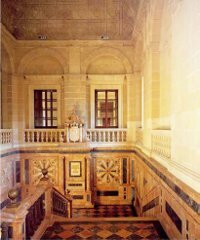 Reforms including the incorporation of a magnificent colored marble staircase – indicating an allegiance to the Baroque tradition at a time when neoclassical trends were already common – were directed by architect Luis de Cintora between 1758 and 1789, while the mahogany shelving was the work of sculptor Blas Molner. To this day, the Archive continues to house a staggering number of historical documents (43,175) and maps (3,400), indispensable materials for scholars of the conquest and colonization of the Americas. 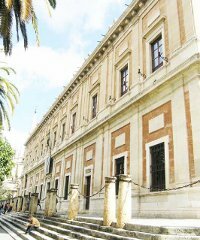 The General Archive of the Indies and the Casa Lonja are protected as Areas of Historical-Cultural Interest (Zona de Interés Histórico-Cultural), approved by Spanish Royal Decree 1441/1983 on 20 April and published in the Spanish Official Bulletin on 3 June 1938. The buildings housing the archives, libraries and museums are subject to the regulations established for Areas of Historical-Cultural Interest under Article 60 of Law 16/1985 of 25 June, On Spanish Historical Heritage. Source: "Sevilla", Juan Pablo Navarro. Editorial Maratania.